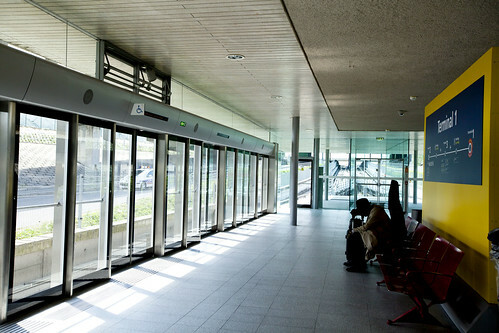 When my best friend HC and I were waiting at Newark for our flight out to Paris, we had the sudden interruption before flight that all the passengers in our flight are delayed there for the an additional three hours (on top of the 7.5 hour flight). Supposedly, there was a concern about the superficial dents on a portion of the plane’s belly that they had to get it repaired, tested, fill out paperwork and have approval from the control towers to get the green light to fly out of here. All of this crap takes three hours? As you and I know, this doesn’t look like food. It looks questionably inedible. But as I paraphrase HC, this is for the sake of survival. I sucked up my food snobbish ways and tucked in, for better or worse. As long as I’m ok and have enough energy to get off the plane, haul my bags over to the center of Paris, I’ll deal with it. We all made it in one piece. Except I lost sleep just because I can’t sleep well on a plane and I kept thinking what I could have done in Paris with the three hours that I should have gotten. At any rate, we got our luggage, breezed through Customs, purchased our RER train tickets and a carnet of Metro tickets to travel within Paris (it’s cheaper than getting the Paris Viste pass, IMO) at airport terminal station, took the 45-minute train ride to the city, and schlep our stuff into our hotel room once we got into Paris. Since it’s around 1 PM and we’re getting fairly hungry I planned to get the famed falafel sandwich from L’As du Falafel in the 4th arrondissment. 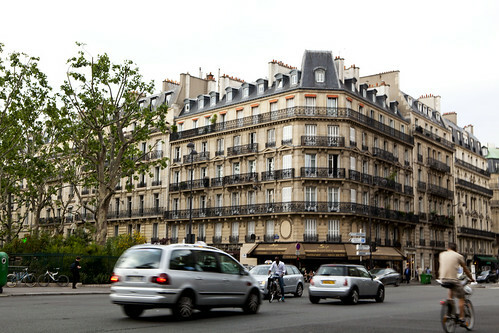 Being tourists that we are, navigating around Paris was tedious to say the least. 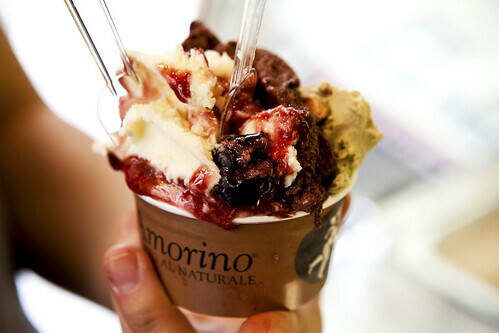 We got lost and kept passing through Amorino Gelato, who was conveniently nearby. HC and I entered the boutique and I asked in French if she spoke English? The young woman behind the counter said in pretty good English, “I know a little.” So, I start asking her slowly in English, “Where is L’As du Falafel?” She responded, “Oh, it’s just two blocks away; make a right at the first corner and make another right.” Sounded easy enough. I thanked her and promised we’ll be back after lunch. When we finally walked to L’As du Falafel, we asked for a table for two. 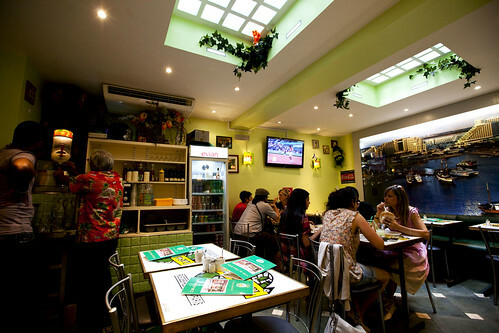 Entering this funky, eclectically decorated dining room in the back, painted in mostly citron green with articles (especially The NY Times back in 2006) and photos of Parisian celebrities who tout of this place. Having high hopes of eating the falafel of my dreams, we both ordered a falafel sandwich and freshly squeezed juice. Hands down, this is an amazing falafel sandwich. A two-fisted sandwich stuffed with gloriously fried falafels that were neither dense nor greasy (which is key), layered with fresh cucumber and tomato salad that’s mixed with a yogurt-y minty dressing, and slices of beautifully grilled, tender eggplant that almost mimics as meat. Oh. My. Goodness. I haven’t encountered a foodgasm with a falafel sandwich in eons and this really hits the spot. There were spicy sauces that were sitting on the side of the table. The green sauce was a super spicy sauce that just kicks the back of your throat and make you want to yelp in pain a bit. The red sauce, though, was something else. It’s mildly spicy. Tasted like there’s sundried tomatoes blended with a bit of spicy pepper and a certain tangy flavor in it. It tasted amazing with this falafel sandwich and we can’t stop dolloping a spoon and top our sandwich with it. In all of the years I know HC, I never seen her eat and love a spicy pepper sauce. Except now. At the end of eating our sandwiches, we felt stuffed and for 7€ (dining in, for this sandwich only; should be cheaper for take out), this was really cheap eats. Keeping my promise, we waddled back to Amorino Gelato and I gotten myself a petit cup of gelato (3€). The flavors I chose were Sicilian Bronte Pistache (Sicilian Bronte pistachio), Cioccolato Amorino (Amorino’s Chocolate blend), and Amarone (a vanilla gelato swirled with black cherries). I don’t know what the hell Parisians do it; this gelati was divine! 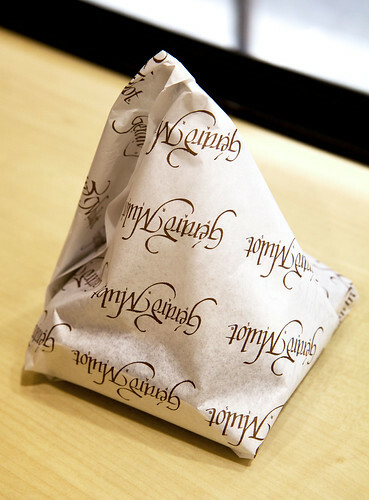 Each flavor was super intense (never encountered that in NYC) and it’s rich, dense and creamy. The small cup went a long way for this sweet tooth, ice cream lovin’ person. As I watched other patrons ordered, while I’m eating my gelati, Amorino does create rose-shaped ice cream if you do order a cone. It does look pretty but I don’t have any more room for food. To burn off some calories from my late lunch, HC and I walked over to the 6th arrondissment heading over to Gérard Mulot. 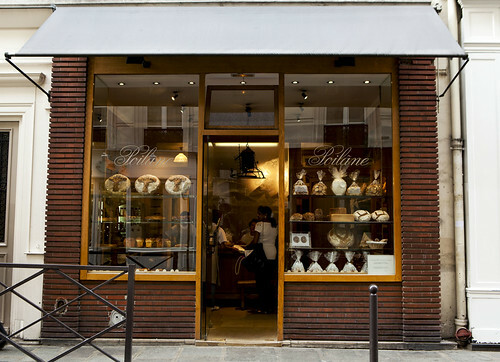 Yup, another dessert/pâtisserie destination. 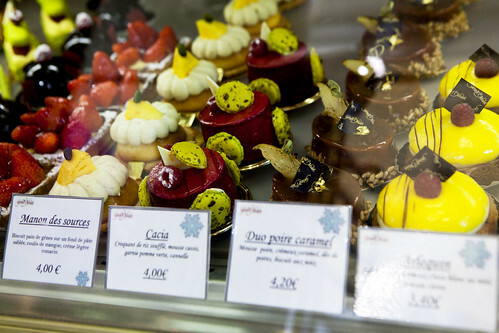 Once you walk up to this pâtisserie’s window, you’ll be bestowed with a lot of beautiful, jewel-like cakes and tarts. Technically, neither of us were hungry but HC and I shared a personal-sized Amaryllis (7.50€) after seeing the beautiful, albeit larger, one at the window display. 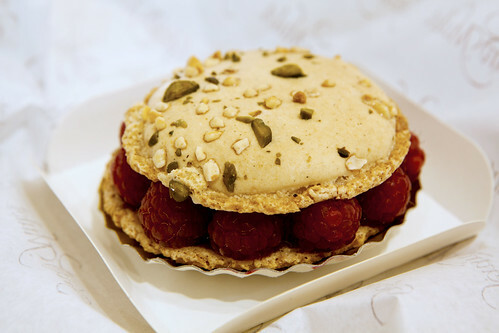 The Amaryllis is composed of a pair of large macarons (or dacquoise, if you want to be technical) studded with pistachios and almonds, sandwiching fresh ripened raspberries and vanilla pastry cream. 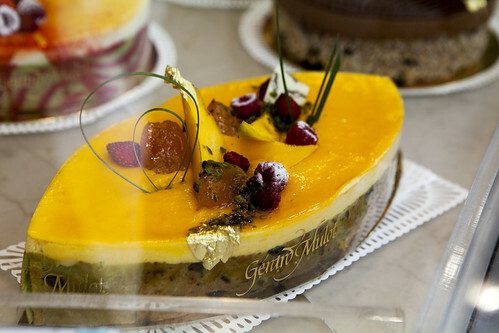 The dacquoise was well made, nutty and it provided enough structure to the barely sweet creamy, tart and fruity center. Not exactly the most earth shattering pastry I ever ate but this was very good and worth visiting. I wish I had more stomach space to try their cakes. 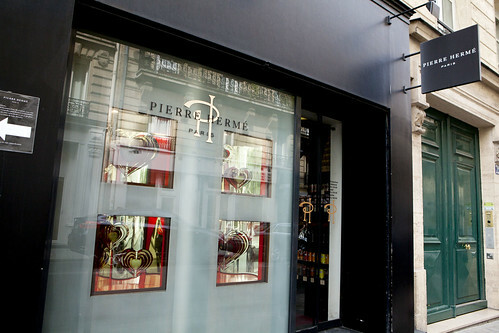 Visiting the original location on rue Bonaparte, I entered into this sleek boutique and tried to take photos. Except all the employees discouraged me from doing so. 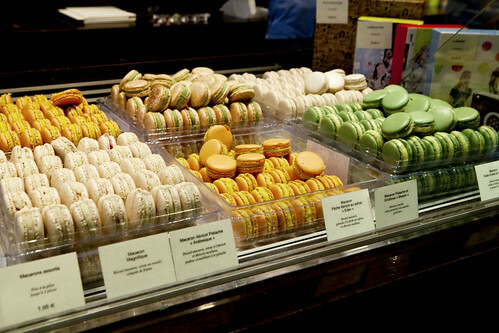 Hence, my only “interior” photograph of this location was the bunch of macarons. So sad. 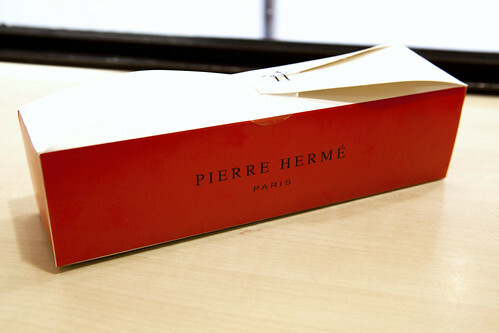 Photos or not, I still wanted a box of Pierre Hermé macarons. I picked seven random ones that looked appealing and eaten all of them in one sitting. All were blissful, intensely flavored bites of macaron heaven. 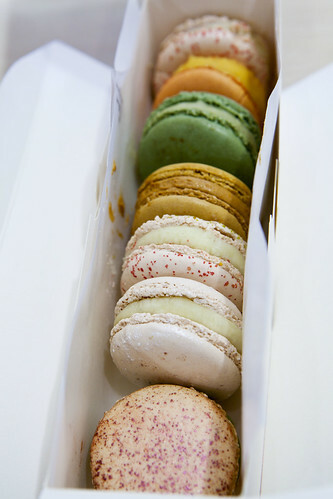 Of the seven I chose, I liked the pistache et griottines (pistachio filling with a cherry center) flavor the most. 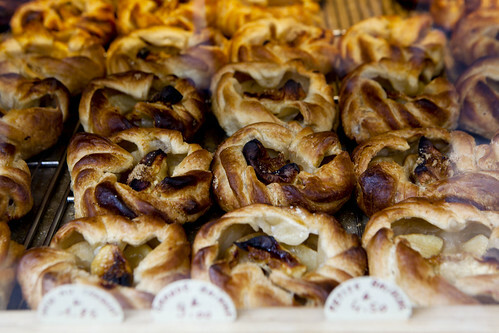 Something about pistachio flavored sweets are done so well in Paris, somehow. Why can’t Americans do any of this well (in regards to pistachio actually tasting like pistachio and making macarons well)?! 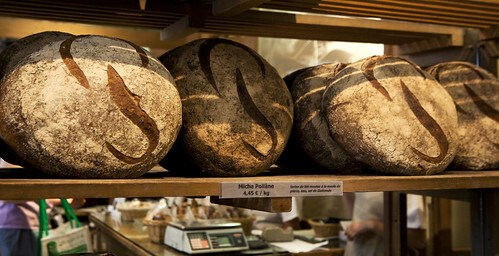 Still on the prowl for more baked goods, I dragged HC along to Poilâne for its famed bread. 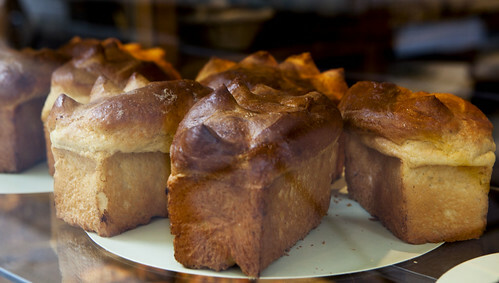 Looking at their baked goods at the window, I can’t help but enter this store. I was hit immediately by the scent of fresh baked bread, mingled with buttery goodness as they just taken out the apple tartlets from the oven. Struggling with the fact that it’s about three hours until my dinner reservation and I’m not really that hungry after eating everything earlier, we had to pass but I made a mental note to come back another day. Making an effort to get ourselves a bit hungry, we burned some calories by doing what we women do best: shopping. 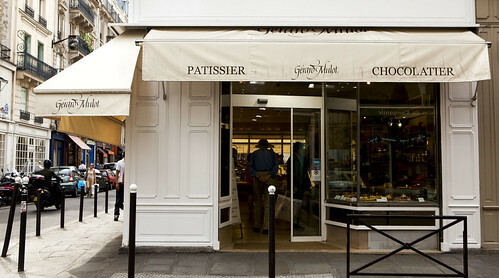 Walking through Boulevard Raspail, we entered one of Paris’ major department stores, Le Bon Marché and wandered across the street to an enormous gourmet supermarket Grande Epicerie de Paris. Think Dean & Deluca supersized (if you’re familiar with the SoHo, NYC location, it’s about 3-4 times larger). 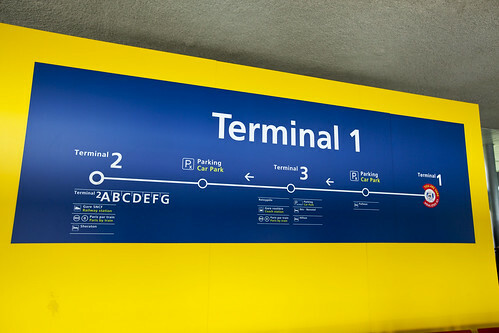 In all, of the torment HC and I went through from our three-hour delay to Paris, we made it in one piece and our bellies filled with very good food and our minds filled with pleasure (teetering a bit with pain, as our fullness gauge were reaching the dangerously stuffed area). I’m probably weird, but I kinda like airplane food. I think I get a kick out of the fact that it’s prepared 33000 feet up in the sky. On that note, carb overload haha. So glad that you liked L’As du Fallafel! We love it too. Looking forward to more posts about your trip! 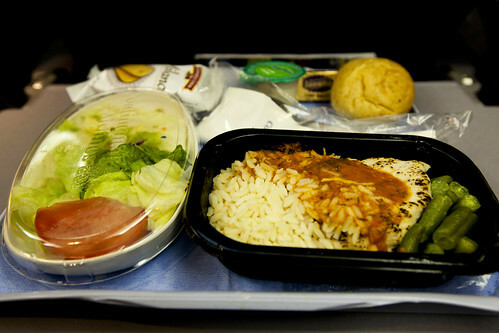 Nicolas: Not all airplane food was awful as the one I ate on the flight to Paris. The salad’s greens were limp and a few leaves had a brownish tinge on the edge; the so-called chicken and rice tasted like cardboard. On the way back to NYC, the airplane food tasted 100x better than what I ate. I guess the European prepared airplane food almost always tastes better? 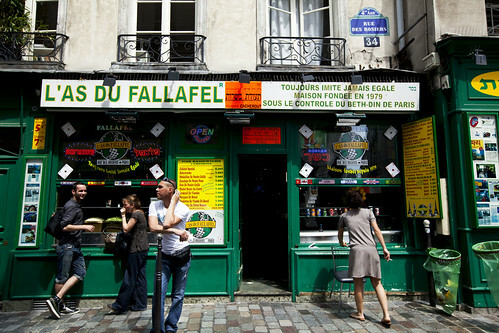 Paris by Mouth: L’As du Falafel is awesome. Second best falafel sandwich I’ve eaten is Taïm in NYC. 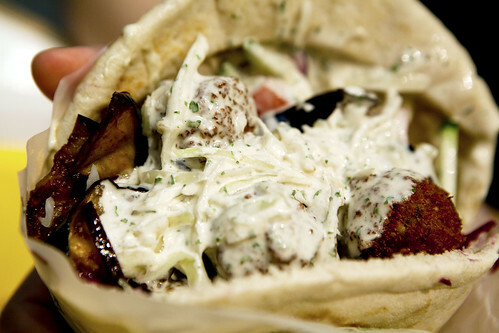 I need to expand my falafel horizons. 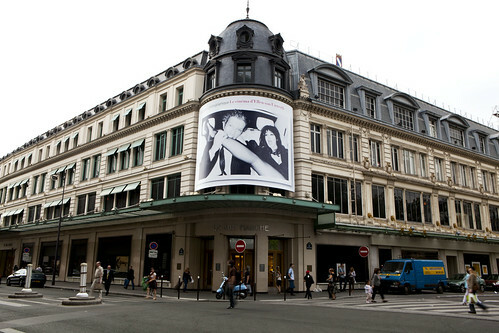 Just wanted to say great pics/blog on Paris! I’ll be heading there myself at the end of September and the information you provided definately helped. 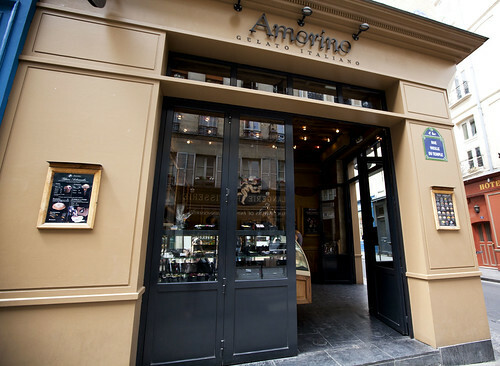 Ohhhh…can’t wait to start eating though I’m sure I’ll come back to North America much heavier by the time I’m done w/ Paris~!